Radio station. High power station used from Army Commands for long distance communications. 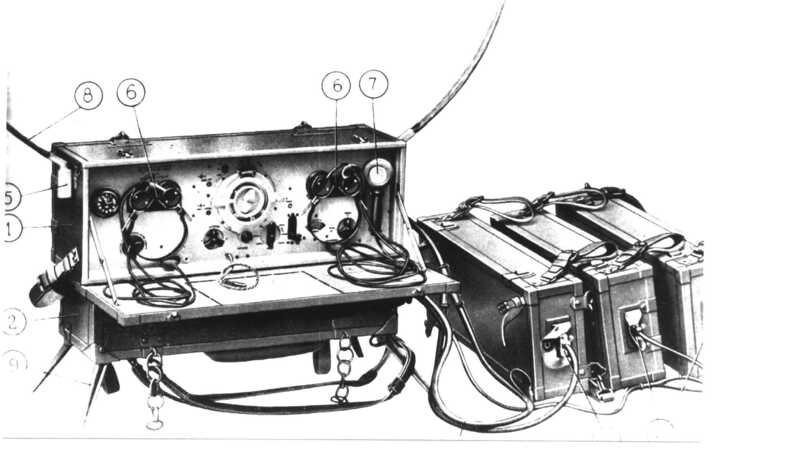 Separate receiver and transmitter. PSU for TX, PSU for RX, Controll panel, storage batteries and engine generator. Radio station. Manpack. Low power ground station for infantry communications inside the small units in the range of 3-10 Km. It has been the standard italian manpack. Built in many versions and from several manufacturers. Power supply : Multivoltages dry batterie. 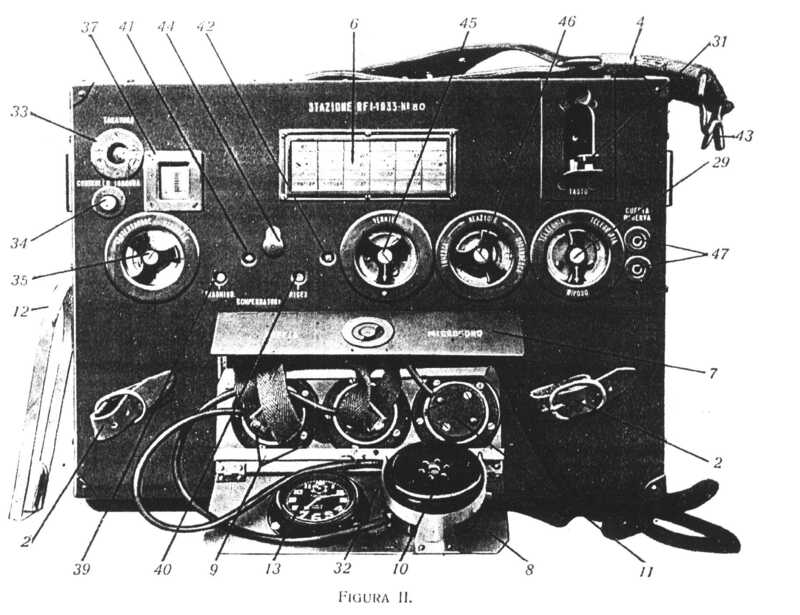 Mod.36 Manufacturer CGE - Clock on the right of the front panel. It has a lamp antenna tuning indicator. Improvement on AF stage. Mod.36 1940 serie. Manufacturer CGE. Same as Mod.36 with small circuit improvements. Radio station. Transceiver. Designed for tank purpose and working on the same range of frequency of German tank. Intensively utilized in N.Afrika. 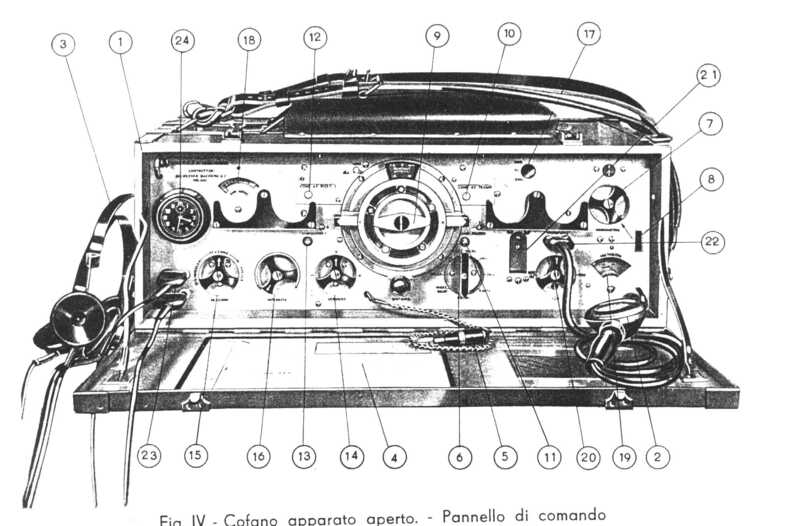 It was also a version for ground use called "RF 1CA in cofani" where the complete unit were in 3 chests including accessories and antenna. Range 3-12 Km. Facilities : MCW, RT (AM), Interphone. Aerial : Rods (4 elements) for ground and whip for tank. Transceiver TR7, PSU type AL-1, Antenna tuner, RF Oscillator/calibrator, Accessories and antenna system. Power supply : AL-1 - Dynamotor driven by 12 V storage batteries. Frequency Range : 4,280 - 5,250 kHz. Receiver Circuit (Valves) : Superheterodyne using 5 valves D11F or D1F plus one D12f like AF amplifier that works also like modulator for TX section. Aerial : Vertical. Short antenna 1.3 m for range 10-15 Km, Long antenna 5,6 m for range 20-40 Km Both have a capacitive hat. Power supply : Multivoltages dry batteries contained in a suitable box. Power supply : Dry batteries contained in a separate chest. Radio station. Ground or tank installation. 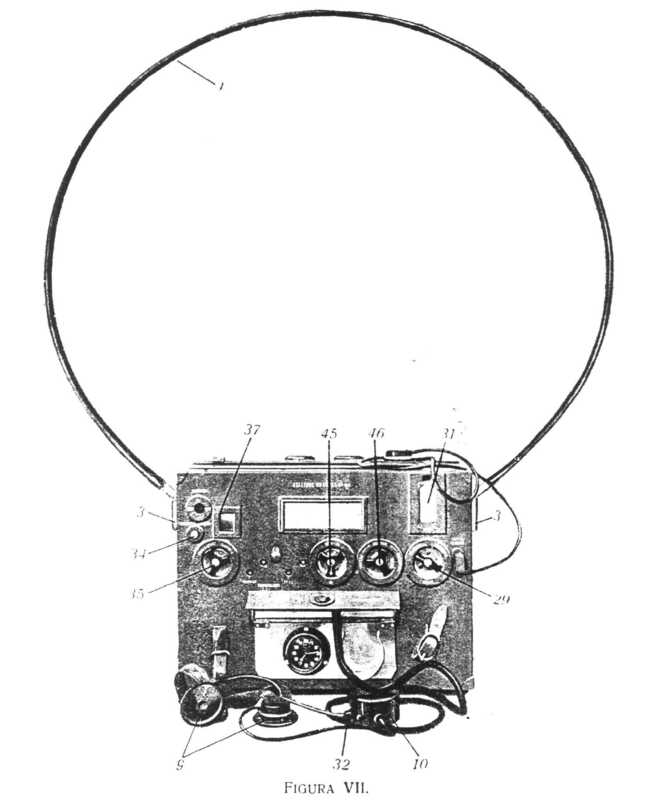 Used for communications among tanks squadron commanders. Usually mounted on "Carri comando (Command tank)" in parallel with the RF 1CA. Aerial : Rods 2.7 m high. Transceiver TR4, PSU AL1, Antenna, Accessories bag, Cables and storage batteries. Transceiver TR4, PSU AL1, Control box, Antenna, Antenna tuner, Cables, Accessories. Aerial : Inverted L, 40 m Dipole or vertical. Power supply : Dry batteries contained into separate chests. Radio station. Portable. Used from Armoured and Motorized units like fixed or semifixed station for inter units communications in the range of 20-50 km. Usually carried by a motocycle with a sidecar. Power supply : Dry batteries contained in separate chests or pedal generator. Presettable frequencies : 4 channels. Facilities : CW, RT (AM). Power supply : By dynamotors driven by 12 V storage batteriesof the vehicle. On 1942 come out an updated model branded RF 3M2 Mod.42 with some internal improvement and different front panel. Radio station. Portable. Called also "Unificata" because it can replace the R4 and R4A. Used for communications among large units commands, and for aerocooperation. The station is divided in 2 chests: 1) Receiver, Transmitter, Controll panel; 2) PSU, Battery charger, accessories. Radio station. Portable. Similar to RF 4. Replacement for R4D but also for R4A.The station is divided in 2 chests: 1) Receiver, Transmitter, Controll panel; 2) Dynamotor PSU, Battery charger, accessories. Power supply : 12 V storage batteries. Mains for battery charger. Radio station. Built for field operation in tropical environment. Pedal generator or engine driven rotary generator. Radio station. 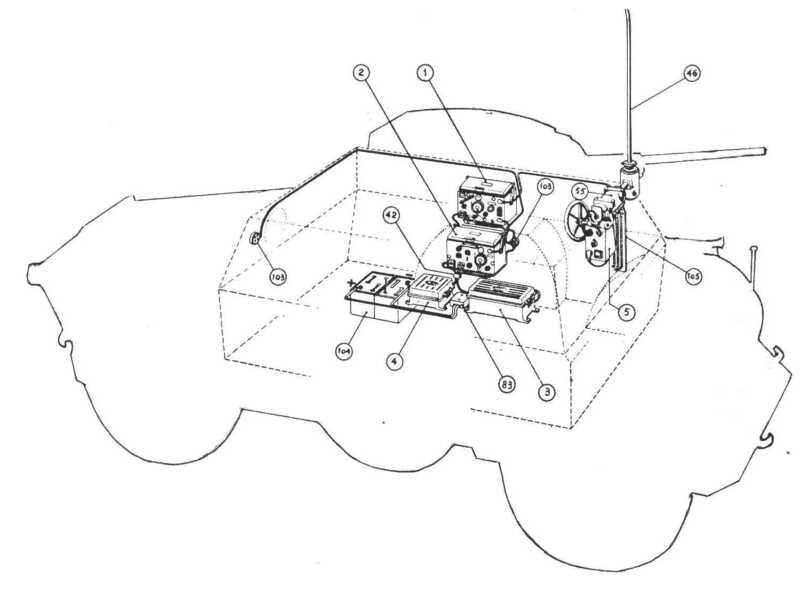 Separate receiver and transmitter. Portable. Tropicalized. Studied to be camel carried. Range 200-400 Km. 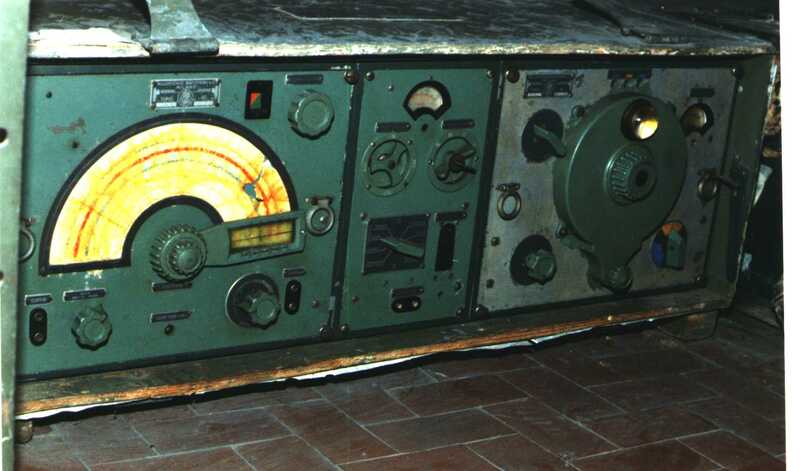 Frequency Range : 3.571 - 8.333 MHz. Transmitter Circuit (Valves): MO(TU430), PA (RTS4), Mod.(RRBF). Pedal generator or dry batteries.